When flying Icelandair, bring food and water, especially if your layover in Reykjavik is from 11pm-1am. Everything is closed and there are no water fountains. Drink (water) to battle jet lag, at every opportunity. Toulouse’s symbol is the violet and you can find things made with violet everywhere. Use the restroom on the train because it’s free (unlike the €.70 ones in the train station), but don’t expected it to be clean. E. Leclerc (French grocery store) is not the same thing as E. Leclerc Drive. French children can be just as loud as American ones. Wine is unbelievably cheap. €4 for a beautiful rosé. Fresh squeezed orange juice is always the best option. 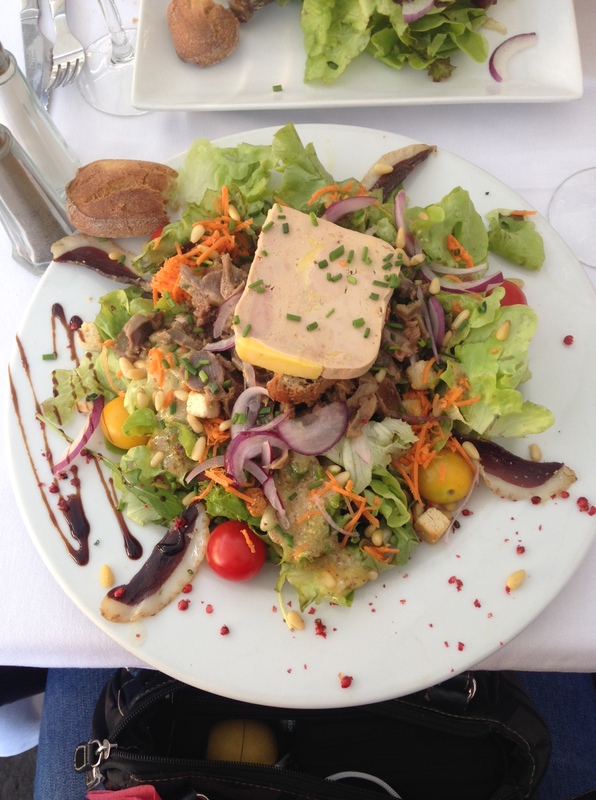 Foie gras in France bears absolutely no resemblance to the pale, lard-like imitation under the same name found in the United States. 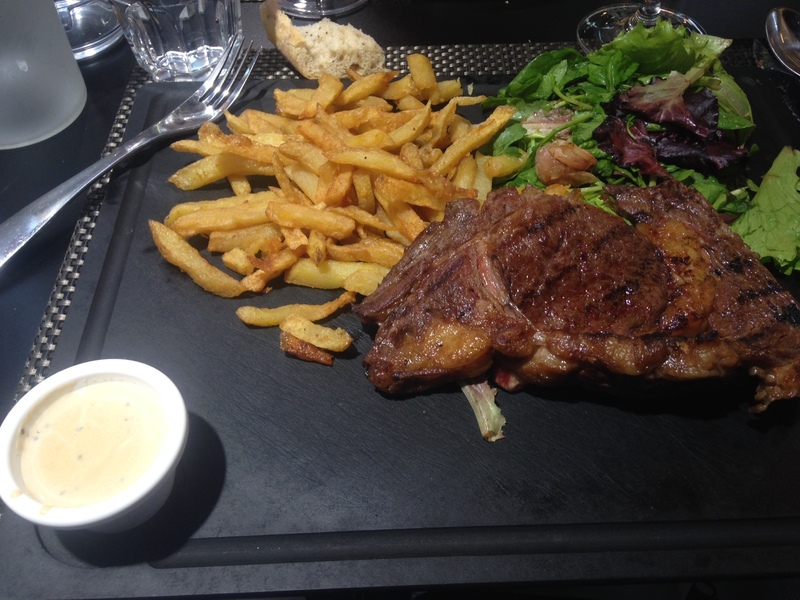 À point is medium rare. Saignant is rare. Bien cuit is well done. These phrases are important. Free Mobile’s €19.99 plan is amazing. Unless you need coverage everywhere, in which case you discover that you get exactly what you pay for. Having a bank account in France makes everything easier (I do not yet have one). The Paris metro is somehow easier to navigate than New York’s. The trains have a magical ability to lull you either into a daze-like state or to sleep. Set an alarm. Entrecôte with fries and salad… of course, the first course was a mozarella, pesto, and sundried tomato salad and the meal ended with chocolate mousse. Splurging for the first full day in Toulouse! The end of the season has crept up on me, like it does every year! However, this summer’s end is more of a change than ever before, as I exchange my “drive out to Oberlin” tradition of the last five years for a much longer commute across the pond to France. Before I begin to document my European adventures, the events of the past few months merit descriptions, all of which I am thrilled to share with you! In May, I received both of my diplomas from Oberlin. Those expensive little pieces of paper that try, but fail, to summarize five years worth of work certainly look nice framed and boxed up, waiting for the wall of some future office. I already miss Oberlin, its tireless professors, and the unlimited practice time. There is no place like Oberlin and we Obies certainly know that well! This summer began with Corpus Christi at the Church of the Advent in Boston, where Mark Dwyer and Ross Wood have added a harpsichord to their list of fine instruments. 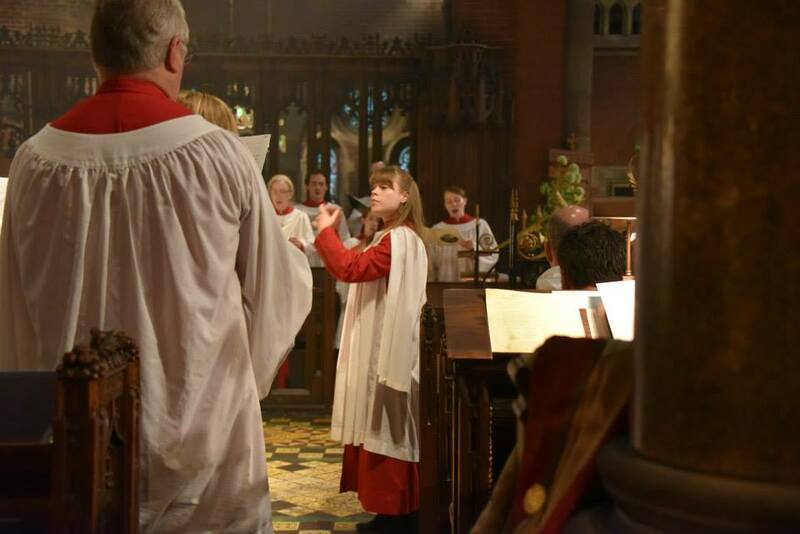 The service was full of music by William Byrd sung by the choir and performed on the harpsichord. Playing Byrd’s music in the smoke-filled room added a new layer of mystery to the event. The annual procession around the church certainly shocked Charles Street and the tourists wandering nearby! I went from Boston to New York City where I presented a “young artists” program with Mary Copeley, Ashley Snavley, and Emma Whitten on the charming Fisk organ at the Church of the Transfiguration. It was an honor to participate in a weekend of concerts at the Museform conference and to hear the music of such distinguished organists. I look forward to future events! 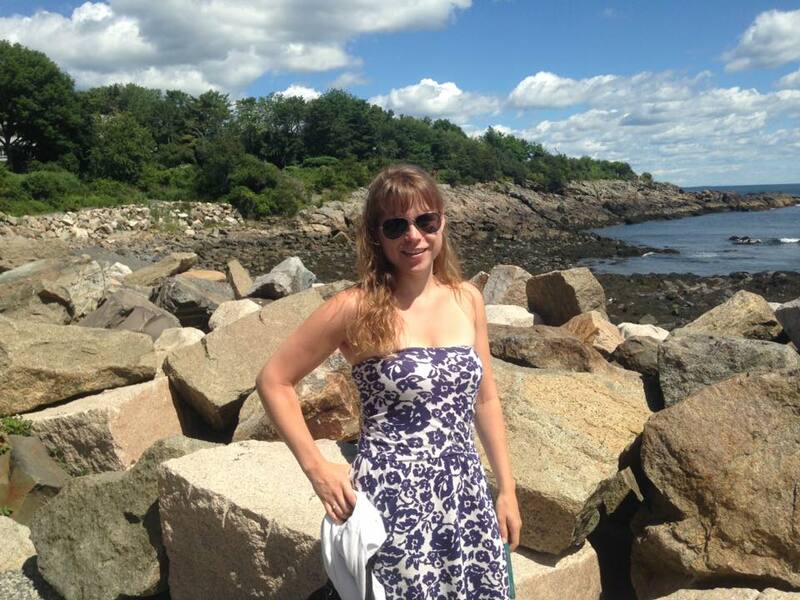 Having played in NYC on Saturday morning, I quickly returned to Maine for a concert, sponsored by the Keith McClelland Music Foundation, the next day in Cape Porpoise, Maine, a stunning and must-see town past Kennebunkport. I have never played for such an appreciative audience as that of the Church on the Cape. Even more shocking, after listening to my playing, the Foundation’s board was so inspired by the music that they wished to support me in my future studies, offering me a scholarship to accompany me as I moved forward! Words cannot describe how grateful and how amazed I am by their generosity, especially since I only hope to move and reach people through my music. To have this response is nothing I have ever experienced and I am truly humbled by this church family and by their support. The Northeastern Convention of the American Guild of Organists was held in New Haven, Connecticut and certainly showed off the unbelievable instruments that Yale University and the town of New Haven have available. The sparkling jewel of the city, the organ at Woolsey Hall, was displayed in completely different, but equally astounding, ways by Peter Richard Conte for the opening concert and by Tom Murray for the closing concert of the convention. The countless other concerts combined with these made New Haven’s convention one of the most successful I have yet attended. I was privileged to present a workshop on recently published voluntaries to a room with over 60 attendees. There was not an empty seat to be found and I ran out of handouts! What an honor to be able to share ideas for preludes and postludes with colleagues and I was thrilled that it became a discussion of attendees favorite music. July found me at the University of Massachusetts at Amherst’s Summer Conducting Institute. This is a must for anybody wishing to spend three intensive days focusing on their conducting technique. I was one of eight choral conducting fellows, which meant I got over two hours of time on the podium in front of the responsive, 40-voice volunteer choir and string quartet. The faculty, consisting of Tony Thornton and Wayne Abercrombie, is extremely attentive. These teachers want the conductors, of a variety of levels, to access the next level of their musicianship and they work to create a welcoming atmosphere in which to grow. 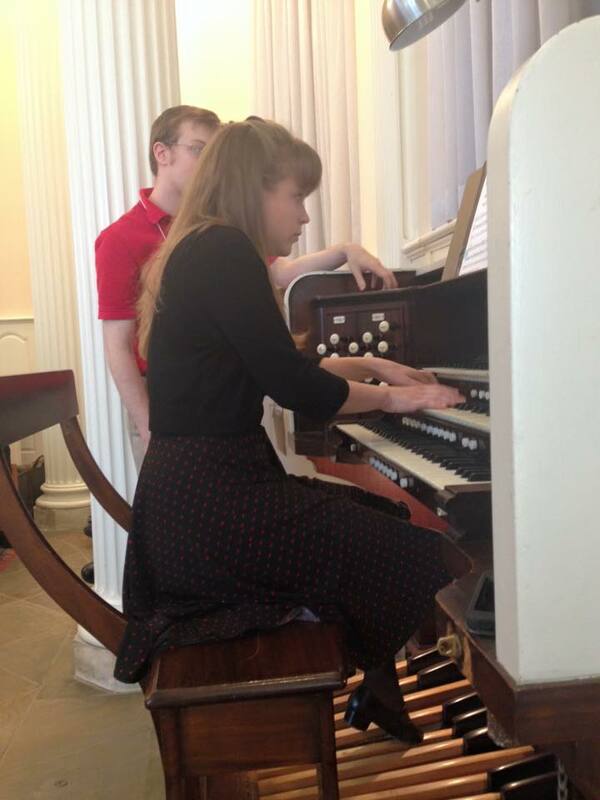 From UMass I traveled out to Brooklyn, New York, where I was both faculty and chaperone at the Pipe Organ Encounter. 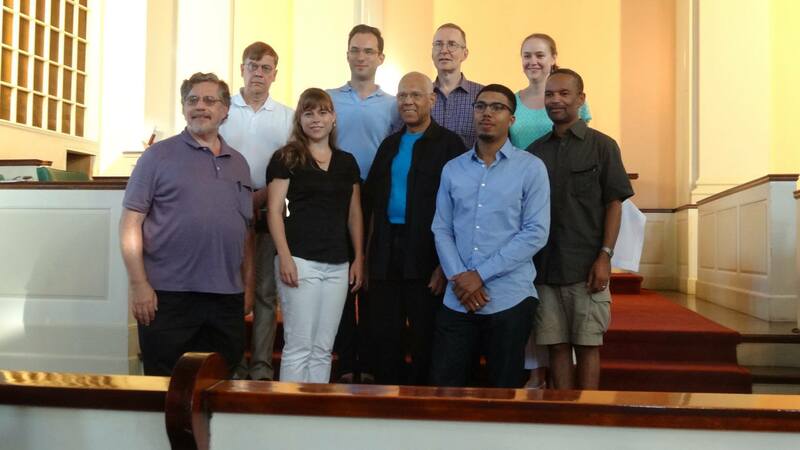 What a week, with 21 enthusiastic, talented students studying with 10 esteemed faculty members! I was honored to be a part of this program and am in complete admiration of the planning committee, especially Eric Burke. The “borough of churches” really rolled out the red carpet by sharing their instruments and spaces with all of us for lessons and recitals throughout the week. Especially unique to this POE were the numerous workshops offered by the faculty. These enabled all of the students to really get to know each teacher and learn about many different aspects of the organ and organ playing, including composing for the organ, practicing, Russian organ music, and competitions. Of course, the best part of the week was finally getting to hear the students play on Friday evening’s concert! This last month, I visited New York City to see friends and have a little time off (however shocking that may seem!). During this time, I learned of the passing of John Scott, the unparalleled organist and choirmaster of the great St. Thomas Church on Fifth Avenue. I attended the Requiem Eucharist at St. Thomas the day following his passing and felt privileged to be a part of the congregation of hundreds coming to testify to his amazing life. Although he was one of the best organists of our day, he was even better known as one of the most exceptional people in our field, always generous with his time and knowledge and tirelessly genuine. He lived by the phrase soli deo gloria and invited all others to do the same. The service was a celebration of a man who inspired all of us through his music-making and through his love of both music and people. The last two weeks have seen me in and out of Boston, during which I was also able to visit St. John’s Seminary in Brighton and hear the beginnings of the new Andover organ being put in. It was a privilege to play an instrument in its early stages of installation and the organ will sound simply glorious in the chapel’s acoustic!